Stocks set another record high in early trade, but it was all downhill from there as we closed lower by half a percent. The last 15-trading sessions put together a tremendous run, so it is no surprise a down day was waiting for us. Markets go up and markets go down, and today’s price action was simply one of those down days. I heard a lot of chatter about an outside day or an engulfing candle. That is when both today’s high and low are higher and lower than yesterday’s high and low. While I’m not real big on trading technical signals, we use this widely made observation to figure out what other people are thinking and how they will trade it. By most accounts this is a negative pattern, but in this case it will be a self-fulfilling prophecy. When prospective buyers expect lower prices are imminent, they wait for the market to come to them. While holders remain confident and are not worried about a few down days, if buyers sit on their hands, prices go down no matter how confident holders are. Many professional money managers are behind their benchmarks heading into the last two months of the year. While they feel pressure to chase, they are reluctant to buy a market that was up 13 out of the last 15 sessions. They will wait for the market to come in a couple percent before they feel good about buying the dip. That pressure to chase will keep this selloff relatively shallow as big money buys every dip, but over the medium-term, a little sideways consolidation is constructive and supports a sustainable rally into year-end. The catalyst for today’s drop was the Fed staying the course. In a vacuum, this would be considered bullish because it continues the easy money policy. Things get more complicated when we factor in what other traders expected and how they were positioned. Most saw this coming from a mile away and were already positioned for an uninterrupted continuation of QE. This leads to a buy the rumor phenomena as traders act in anticipation of an event. But since everyone say this coming, there were few left to buy the news today and we fell due to the vacuum of demand. Remember, markets only move when people trade, and people only trade when they change their mind. This Fed meeting didn’t change anyone’s mind, and thus no one bought the news. Expect further weakness over coming days as traders sit on their hands following today’s engulfing candle. We will likely slip to prior support near 1740 before dip buyers jump to the rescue. This could be a couple of days or couple weeks, but the important thing is this is only temporary weakness and we will resume making new highs before the year is over. If the expected outcome is a little down and then a little up, then the alternative is a big move either direction. Given how far we came over recent weeks, it is hard to see an explosive move to the upside. With the budget and debt ceiling pushed to another day, there is little hanging over the market to act as an upside catalyst when the risk is removed. Given where we are, there is more risk to the downside if we are blindsided by a new risk element not already factored in. This isn’t Taper or Default, but something all new. I don’t know what or when, all we can do is wait and respond proactively when we see it. Anyone out of the market, here is your chance to get back in. We will likely see a dip to support near 1740. Depending on how aggressive dip-buyers are, we might not even fall all the way to support before desperate buying turns the market around. Or we could see the market penetrate support and set off a wave of stop-losses before rebounding. No one has a crystal ball and we simply have to wait for the situation to develops. Bulls should not try to catch a falling knife if we start selling off. Wait for it to find a bottom and stabilize. There will be plenty of time to get back in when we find support. Better to be a little late than a lot early. On the other side, bears with a short positions need to recognize this is a counter-trend trade and that means taking profits early and often. Making money in the market is easy, the hard part is keeping it. Bears have seen a lot of good downside trades and they would be having a good year if they were disciplined about taking profits. Another up-day, making it thirteen out of the last fifteen. The market continues defying both bears and gravity, but how long can it last? The rate of gains slowed after we passed 1740 as traders grew more cautious of these dizzying heights. So far the market is giving every indication we transitioned to a directional phase and that means countless new highs are ahead of us. But like every move in the market, it won’t be straight line and we should expect an occasional step-back for every two-steps forward. Bears are obsessing over the low-volume. In their view, we cannot trust any move that doesn’t have a lot of people participating in it. But here is the thing, traders do more than just buy and sell. In fact, they do a more holding than anything else. We are rising on low-volume because most owners don’t want to sell and that speaks “volumes”. Every dip this year was a buying opportunity and anyone who fell for the head-fakes doesn’t want to be fooled again. While this market will top like every one before it, it won’t be because of owners’ complacency. That is another popular misconception. When owners are disinterested in selling, that keeps supply tight and makes it far easier to rally on modest demand. Low-volume strength was the secret sauce for the first-six months of the year, and early indications are the same behavior will close the year too. But that is the two-month outlook. Trading over the next few days will responded to different currents. It is really tough for big money to buy a market that is up nearly every day over a three-week period. We saw a lot of short-covering and breakout buying push us higher, but these active traders represent a small sliver of the market’s capital. Soon these gains will stall when big money doesn’t continue buying this nearly non-stop move higher. We don’t need a big dip to interest underweight money managers, but they need something to ease their conscience that they are not buying the top. It is perfectly reasonable, normal, and healthy to see this string of up-days take a break and the market to re-test support at 1740. That is actually far more bullish and sustainable than continuing higher without resting. The potential catalyst for a modest pullback is the Fed meeting. Most traders, including myself, are not expecting a change to QE, but that means it is already priced in. We don’t need bad news to soften the market and could actually dip on good news if the market sells the news. While I still believe most of the Taper trade is long behind us, it could easily inject a little volatility, leading to a near-term re-test of support before we brush it off and resume the up-trend into year-end. While I think the up-trend will continue, we should expect some near-term weakness that allows the market to consolidate recent gains. Depending on a trader’s timeframe and risk-tolerance, they can either choose to hold through the dip, sell into strength, or for the most ambitious and nimble, take a stab at trading the counter-trend move. I still expect the market will make new highs in coming weeks, but near-term down-days are an important part of moving higher. There is no reason the market needs to pause and could actually accelerate into a climax top. These things go further and longer than anyone expects and the least expected outcome is another week of non-stop up-days. But this is a less likely outcome and to succeed in this game we need to always consider the risk/reward of any trade. While it is conceivable we could continue higher for another few days, how much downside risk are we exposing ourselves to for a few extra points of upside? The goal isn’t to make all the money, just the easy stuff. This is the wrong time to be initiating new longs. The market already expects no change from the Fed, so there will not be a sustainable pop on the news. In fact, if there is a pop, that could be a good opportunity to lock-in recent profits and looking for a better level to buy back in. Longer-term traders can hold the volatility because so any near-term weakness looks like it will simply be part of the process of moving higher. AAPL had an ugly reversal and while it didn’t violate support, this is unlikely to be a one day event. $500 is easily in play and risks go up if we fail to hold the 50dma. A lot of traders and investors are excited about the value in this stock, but that increases the risk of it being over-owned. When everyone loves something, who is left to buy it? TSLA had a dramatic day, but managed to pull out of it and actually close up a dollar and a half. While a lot of traders jumped at the chance to buy the stock near $150, I’m not sure the selling is done. Last Friday Musk said the company didn’t deserve this valuation and it is really hard to argue with the CEO. 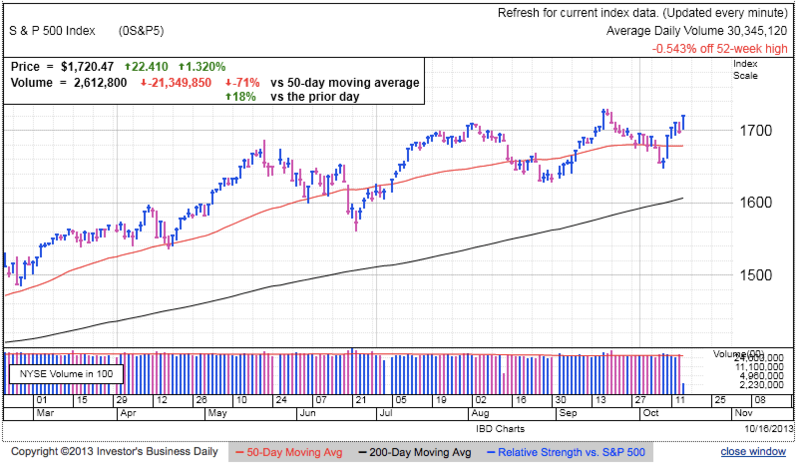 If the stock reclaims the 50dma on elevated volume, then the party is back on, but at this juncture, expect prospective buyers to step back and wait and see what happens. Their lack of buying could lead to further weakness and even more attractive levels for them to buy shares. They will not be in a hurry if they think the stock will get even cheaper. 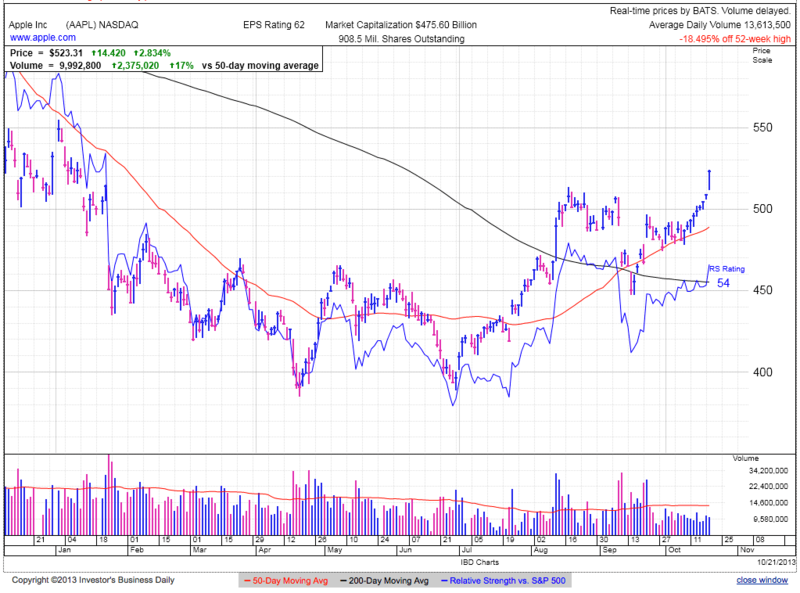 NFLX found support at the 50dma, but volume was barely average and not very convincing. This looks more like dip buying than major institutions using the weakness to add to their positions. Wait for the high-volume confirmation before buying the 50dma bounce. On the other side, owners need to have a plan to take profits. Maybe they sell a violation of the 50dma, or they wait for a breach of support at $270, but either way, have a plan to take profits. It is always better to be out of the market wishing you were in, than in the market wishing you were out. Stocks finished modestly higher, setting new all-time intraday and closing highs, as buyers and sellers continue supporting these levels. The breakout is holding recent gains and suggests we are not on the verge of breaking down. Unsustainable levels see quick reversals and sitting above 1740 for the last seven sessions suggests this is the real deal. Markets can do one of three things, up, down, or sideways. We traded mostly sideways through the summer, but the market is giving every indication we already entered the next up leg. While not a definitive measure, it is interesting to see the Stocktwits SPY sentiment gauge slip from 60% bulls to 45% bulls over the last week and a half. No surprise sentiment surged to 60% as prices rebounded from the Default lows, but we are clearly seeing a negative shift even as the market continues making new highs. This shows many traders are reluctant to trust these levels and they expect us to pull back from recent highs. The thing to remember is most of these cautious traders already expressed their outlook by selling the strength. The market has been resilient enough to swallow this profit-taking and bearish shorting without missing a step,. Further, if those that don’t trust these levels are already out, that means there are fewer left to sell and the resulting tight supply will keep the rally alive. Yahoo Finance had another interesting poll showing 27% still think Cash and Bonds are the best place to keep their money. That ties big-caps and easily outpaces the NASDAQ and Small Caps. 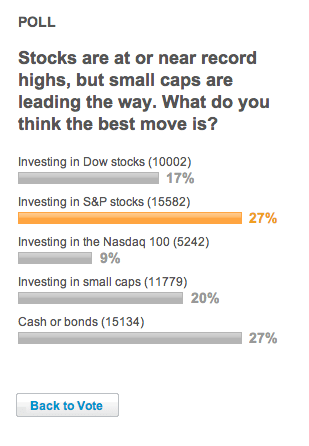 Clearly these last two surveys of sentiment are not “overly bullish”, yet I keep hearing people claim the market is. “Overly Bullish” is the crowd’s state of mind, not a price level, and is the mistake most of these “experts” are making. Contrarian investing is going against the crowd and more often than not that means sticking with the trend when no one else trusts it. Why fight what is working? We expected the market to transition from sideways summer volatility to a directional fall move and is exactly what we’ve gotten. Countless gurus pointed out how horrible September and October typically are and said we should stay away. Of course many are the same people that warned us to sell in May. As long as people don’t trust this market, expect it to continue rallying as the holdouts are forced to chase into year-end. The market is running out of things to fear. We still have Taper and another round of Debt Ceiling talks, but so far those fears are fading into the background. Bears have been the Boy Who Cried Wolf and they are losing their credibility as each crisis turns into a false alarm. But rather than become complacent, we must keep an eye out because the wolf is coming. No one knows when or where, but he is coming. It is tough to buy the market up here, but I have every expectation we will continue higher. How we get there is a bit less certain. Maybe we dip on a headline or maybe we melt up as underweight traders keep buying every dip. Either way, being long is the right call and short is an exercise in futility. Anyone in the market should keep moving up their trailing stops and ride this thing as far as it will go. AAPL reported impressive earnings, but the stock sagged after-hours on disappointing margins. The stock is still holdable as long as it stays above $510. The one thing that continues concerning me is how pros, amateurs, and analysts all think AAPL is a great buy. They point to dividends, cash hoard, buybacks, and China as all reasons this stock will go higher. But if everyone who wants AAPL already has AAPL, who is left to buy? 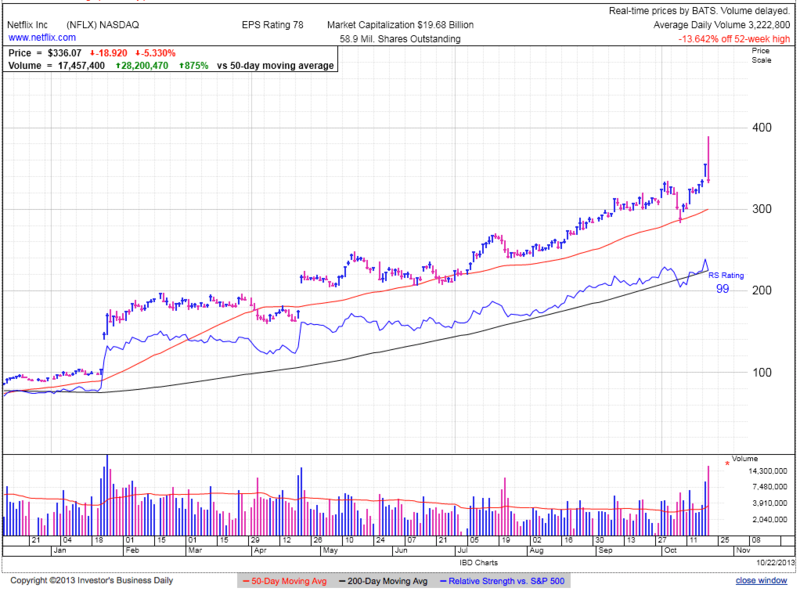 While I think Apple is a great company with popular products, the stock is entering a mature phase. We saw this with MSFT, CSCO, WMT, DELL and every other great growth story before it. There is no reason to think that AAPL is immune from the same decade of stagnant stock price. Steve Ballmer doubled revenues and earnings at MSFT under his tenure, but the stock was stuck in the $20 for most of that time. Cook will likely continue adding to AAPL’s bottom line, but is that enough to move the stock back to old highs? Only time will tell. NFLX is still suffering from the earnings reversal and Icahn hangover. The stock is still above the 50dma and is not screaming sell just yet, but any bull better be prepared for some volatility if we slip under this widely followed moving average. TSLA is a few days ahead of NFLX in regard to penetrated the 50dma. Last week it tried to rally back above this key level, but failed and slipped back under today. The stock is down seven out of the last nine days. For any long-term holders, this might not be a bad place to take some off the table. Sell half and lock in some profits. The adventurous can let the house money ride. We are in this to make money and the only way to do that is selling our winners. Stocks finished at the highs of the day and set another record close. Holding recent gains suggest we are moving past the sideways summer trade and setting up to finish the year with a bullish up-leg. Recent volatility cleansed the markets of weak owners and replaced them with a new crop of holders that demonstrated a willingness to sit through uncertainty and weakness. These holders are being rewarded for their confidence and patience as everyone with a diversified portfolio is sitting on profits. When holders are rewarded for holding and sellers regret selling, it further encourages traders to hold weakness and buy dips. While many will claim this complacency is dangerous and signals an imminent top, we must remember these things go further and longer than anyone expects. Markets don’t top due to confident holders, they rally because no one is selling and this keeps supply is tight. We don’t top until we run out of buyers, and given all the defensive and reactive selling we saw through the summer, there is plenty of demand itching to get back into this market. Yahoo Finance put out a poll today that many bears will point to as a sign of complacency because the single largest response was from traders “not worried” about the rally. 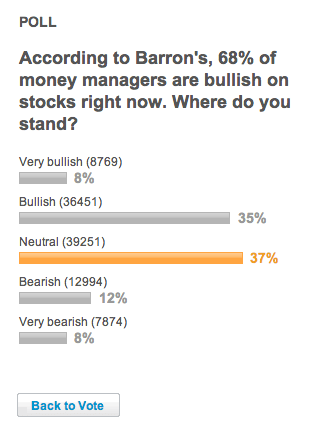 While this 48% is far above the 20% bullish responses we saw a couple of months ago, it is not concerning yet. If we consider the other responses, we see a quarter are selling defensively and another quarter are still sitting on the sidelines. 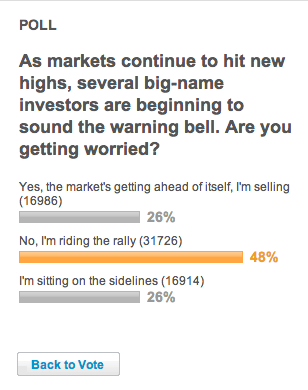 That means 52% still don’t trust this market and remain potential buyers. 48% bullish and 52% bearish is many things, but it isn’t “irrational exuberance”. Today’s strong close shows the rally is not ready to roll over just yet. A few weeks ago I thought we might see a sell-the-news following the debt ceiling compromise, but holding these levels for over a week demonstrates we are not running out of buyers. Anyone left out of this rally is looking for ways to get in. This pressure to chase will cause many to buy any and every dip. The more people we have buying dips, the shallower and less frequent they become. This rally will end like every one before it. It is easy to predict what the market will do eventually, the hard part is getting the timing right. This rally leg is nearly a year old and the bull market is turning six soon, but there is no reason confident owners and money moving out of bonds cannot prop up this market for another twelve months. This is not a prediction, simply stating that markets often go further and longer than anyone expects. But it will end and it will happen when no one expects it. We can ride the confidence and complacency higher, but stay vigilant and look for cracks signaling deeper trouble. Recent strength is putting pressure on underweight money managers who were waiting for the widely expected correction to take some sting from their under-performance. But instead the market is leaving them further behind and they have little choice but to chase into year-end. Ride this rally higher and use a trailing stop to protect recent gains from the unexpected. A stop under 1730 is not a bad place for a recent buyer to limit his exposure. Stocks made new highs in early trade, but slipped to break-even by midday. The market is muddling along as profit-taking cannot dent recent gains, yet new buyers are reluctant to chase new highs. Previous volatility shook out many weak owners and those left standing demonstrated they are comfortable holding. While some claim this complacency is a bad thing, it actually supports prices. Comfortable owners don’t sell weakness or fear mongering, meaning they keep supply out of the market and make it easier for markets to continue climbing in spite of all the calls for a top. Don’t worry about comfortable owners, but fear a dwindling supply of potential buyers. Given how many sold Taper, Shutdown, and Default headlines, there are plenty of recent sellers looking for a way to get back in this market. Their dip buying will support prices and fuel the next leg higher. Hard to argue with what is working. 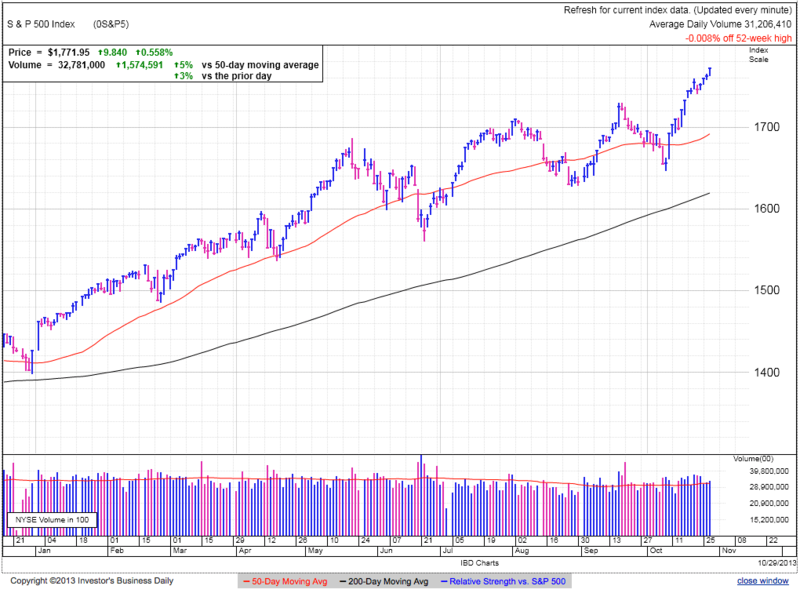 Holding above 1740 for the 6th day shows there is ample demand at these levels and the next move is likely higher. Profit-takers and cynical new-high-shorters have largely sold anything they were going to sell, meaning supply is drying up. Even though investors are wary of new highs, it doesn’t take a lot of demand to push us higher when supply is tight. The market is relieved after weathering a storm of volatility and headline uncertainty. It is making new highs as we avoided the worst-case scenario and took a lot of risk off the table. But with less risk priced in, it leaves us vulnerable to a new headline that is not expected. Markets by nature are always looking for something to worry about and expect it to find something, real or imagined in the not too distant future. Anyone out of the market can use today’s continued support above 1740 as an entry point. If we were at unsustainable levels, the market would have rolled over by now. But as usual, there are no guarantees and we need to cover ourselves with a stop-loss under recent support. Slightly under 1730 gives us enough room to ride out the inevitable dip and test of support at 1740. AMZN crushed bears with yet another short-squeeze. Fighting a stock purely on valuation is a quick way to the poor house. Wait for price-action to crack on fundamental weakness. This also applies to other high fliers like FB, NFLX and TSLA. Let some other poor fool die on the cross of valuation. When these stocks crack, there is plenty of room to fall and we can easily afford to miss the first 10%. It is better to be a little late, than a lot early. Stocks recovered half of Wednesday’s sell off as buyers were willing to step in at these levels. This is the fifth close above 1740 and we are slowly consolidating recent gains and building support. We moved past the fiscal and political driven volatility and the market is quietly digesting third-quarter earnings. It almost feels serene following the all the shouting and political theater a couple of weeks ago. This calm is constructive and lets traders rationally evaluate and trade their outlook without worrying if they are standing on a trapdoor. 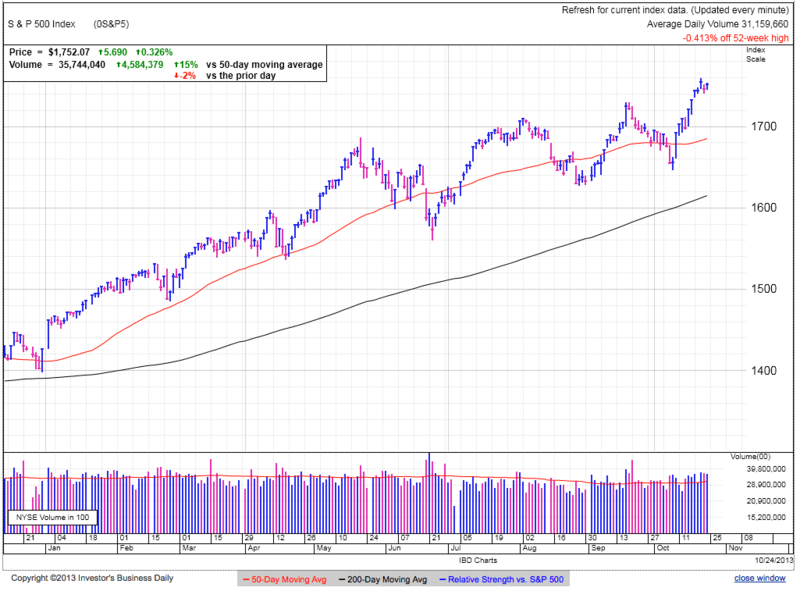 Trading above 1740 for a fifth-day gave profit-takers plenty of time to harvest recent gains and thus far buyers have been willing to step in and defend these levels. Once this wave of profit-taking and cynical new-high-shorting passes, look for prices to continue rallying on tight supply. No matter what people think the market should do, we continue making higher-highs and higher-lows and we cannot fight the trend. Given all the fear and uncertainty over Taper, Shutdown, and Default, the fact the market held up so well signals we are not standing on a trapdoor. The market had every invitation to breakdown, but it bounced instead. That alone tells us the market is not “over-owned” because few owners were interested in selling the endless stream of headline fear mongering. If anything, the market is under-owned since all the nervous sellers over the last few months are looking for a way to get back in. Expect their demand to prop up prices as they rush to buy every dip. Keep doing what is working. While there is nothing wrong with locking-in recent profits, the longer we hold support, the safer it is to buy back in. The rebound chased out most of the bears in a powerful short-squeeze, but it will take time to win over the rest of the skeptical traders standing on the sidelines. But with year-end only two months away, expect big money to feel pressure to chase performance into the end of the year. It’s been a fearful year between Fiscal Cliff, Sequester, Cyprus, Taper, Shutdown, and Default, but the market is standing as high as ever as it weathered the storm. Right now it is hard to think of anything the collective is fretting over. While it feels comfortable, the market is a worrywort by nature and it will quickly find, or invent, another crisis. Depending on what it is and how worked up traders get, we could see larger selling if it catches traders off guard and causes currently confident owners to lower future expectations. Keep a trailing stop at 1710, 1730, or 1740, depending time-frame and level of risk. Those out of the market can look at getting in Friday if we continue holding 1740. 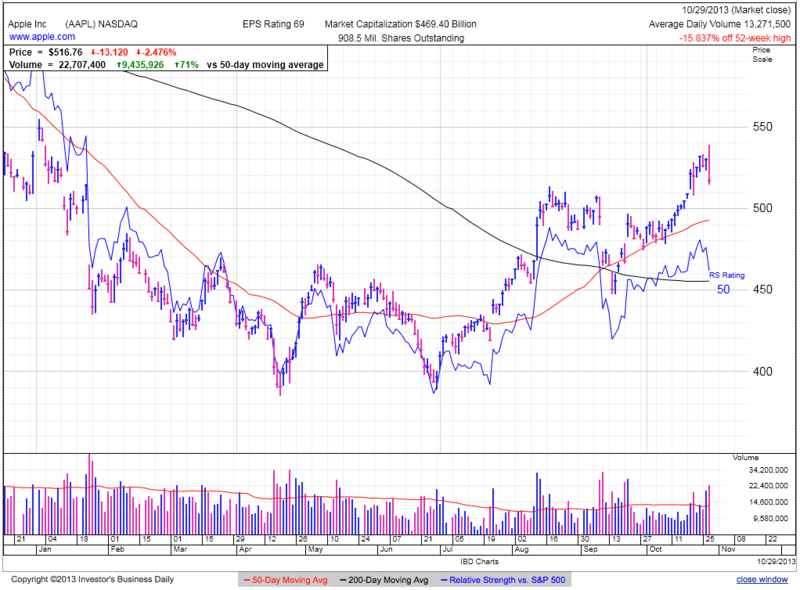 TSLA shook off a dip under the 50dma as it recovered this widely followed level. This is encouraging behavior since it shook out all the stop-losses under the 50dma, but selling stalled and did not cascade out of control. If the bounce continues on high volume, it is a valid entry, but keep a tight stop since we are late in this move and the chances of failure are elevated. AAPL continued higher as Icahn pushed for a $150b buyback. While that would be very shareholder friendly, AAPL management typically ignores shareholder pressure. $513 is support and the stock is holdable as long as we stay above this level. Volatility creates great buying and shorting opportunities for the nimble swing-trader, but its been a tough ride for the buy-and-hold investor. Expect the sideways trade to continue as momentum investors have since moved on to TSLA, NFLX, and FB. AAPL is a great company with fantastic products, but eroding market share and declining prices will prevent it from reclaiming prior highs. NFLX is struggling with an identity crisis following Tuesday’s massive reversal and revelations Icahn cashed in half his stake because the valuation was getting a little rich. Expect this to put a damper on festivities for a while, but if the stock holds current levels in the face of the defensive selling and aggressive shorting, that is bullish because it is building the launching pad for the next leg higher. For shorts, the stock doesn’t break lower soon, cover the short before you are forced to in yet another short-squeeze. 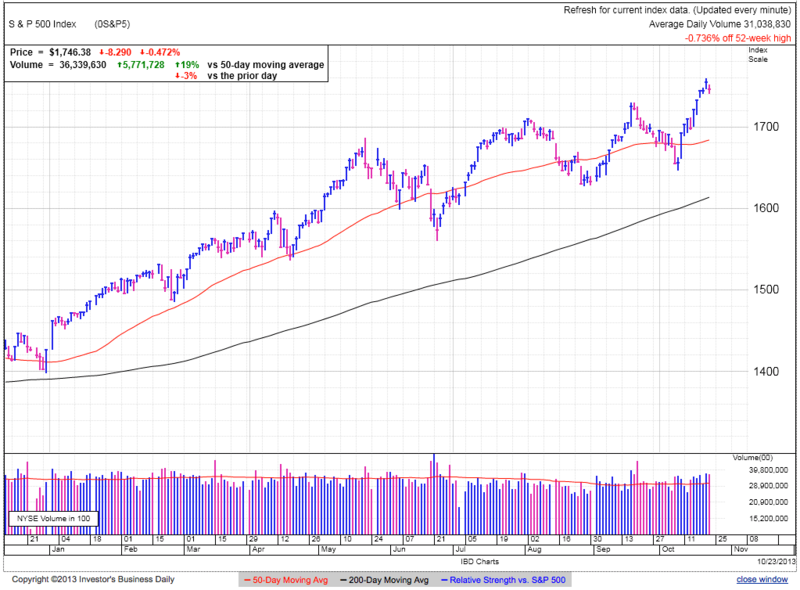 Stocks slipped in early trade, but found support near 1740. We covered 110-points in two-weeks and were up nine of the last ten session; a red day was more than expected. We remain solidly above the summer’s trading range and comfortably above the previous high of 1729. 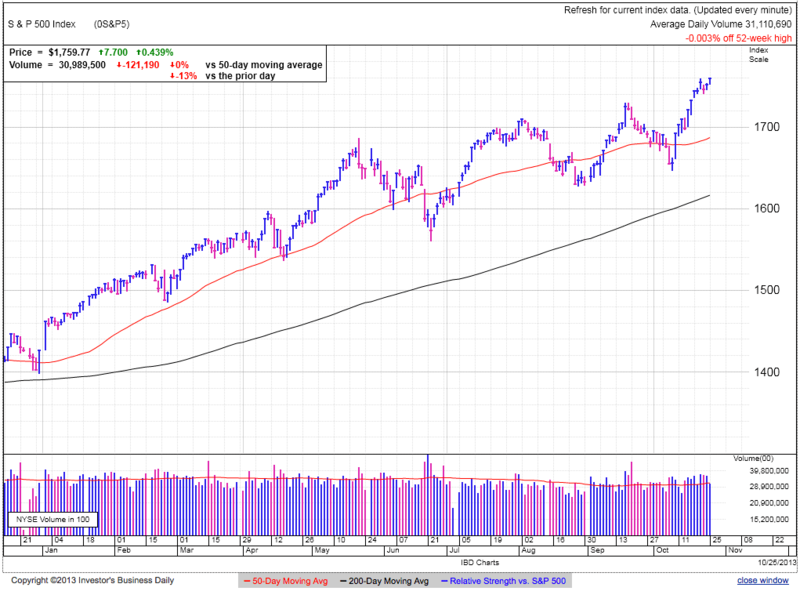 The market often sees a directional move following a sideways summer. We remember the scary drops, but directional trades also take us higher, and so far the upside breakout remains intact. Nothing calms markets like rallying prices. We transition from fear of an economic collapse due to default to all-time highs is less than two-weeks. Not a bad reversal for those positioned to profit from a capitulation bottom, but that was then and this is now. While fear largely evaporated, we must remember markets don’t move on fear and greed, but buying and selling. Even though we feel better, to understand what comes next, we need to figure out how previously nervous traders are positioned following the rebound. Did they recognize their mistake and buy the rebound within days of finding a bottom? While that is a level-headed and disciplined reaction, often traders don’t act rationally. After mixing in pride and stubbornness, expect a fair number of recent sellers watched this rebound in complete disbelief. They didn’t recognize their mistake and reverse their position, they sat there paralyzed by indecision, stuck between visions of a collapse and fear of being left behind. While much of the fear left the market, many shell-shocked traders are still sitting on the sidelines and have yet to embrace the rebound. 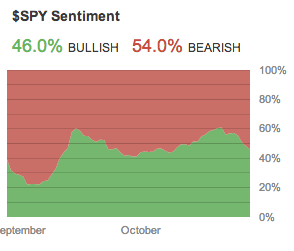 Even though sentiment improved, it will take time for those left out to wade back in. This stream of buying will push the market higher into year-end. 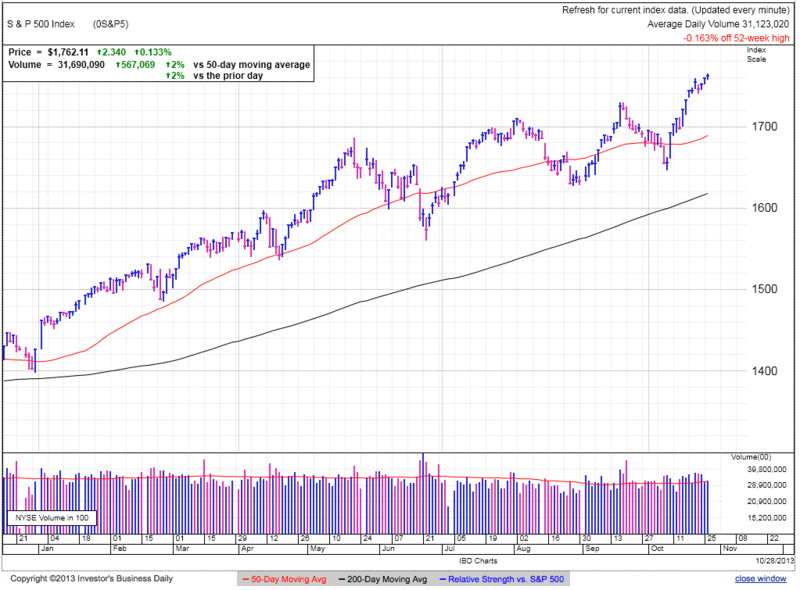 The market will consolidate recent gains and could pullback to 1700 or 1710, but we flushed out many of the weak sellers between the June and August lows. Expect higher prices as confident holders keep holding for more. Don’t mistake confident owners as signs of a top, but an indication continued tight supply. Owners holding through modest weakness and keep a floor under the market. The real key is watching demand. When we run out of buyers, it doesn’t matter how tight supply is. With the huge supply of regretful sellers sitting on the sidelines, we don’t need to worry about exhausting demand anytime soon. While the market came to terms with recent headlines, we are getting comfortable and that leaves us vulnerable to a new and unexpected headline that traders have not priced in. We could go months without a worry and cannot trade the unknown, but we can wait for it and trade it decisively when it comes. We came a long way and there is nothing wrong with locking in profits. For those that insist on holding, keep a trailing stop under recent support at 1700. 1710, or 1730 depending your level of risk. Watching AAPL‘s product event yesterday was revealing, not so much for the incremental hardware and software upgrades, but for how they laid out their core strategy going forward. I have to wonder if they are having a BBRY moment with their stubborn insistence on sticking to their current strategy. Cook and Company took several shots at MSFT‘s “confused” strategy and insisted AAPL’s approach to tablets and computers would not change. Is this similar to BBRY making fun of AAPL’s touch screen and lack of physical keyboard, claiming professionals would never embrace a soft keyboard? In my view, AAPL is making a mistake keeping tablets and computers in separate silos. They insist people don’t want to use a tablet like a computer and a computer like a tablet. But let me tell you, I have enough fingerprints on my Macbook’s screen to prove otherwise. Anyone who borrows my laptop is always trying to use the nonexistent touch interface, but Jobs said it is awkward to reach up and touch a laptop’s screens and he always knows best. Of course he also said a 7″ tablet is “DOA” and now the iPad Mini outsells its bigger brother two to one. Mobile operating systems, processors, and software are nothing more than placeholders until hardware specs catch up and we can fit full-powered processors and software in a tablet form factor while maintaining respectable battery life. We should be there within two-years given the leaps INTC is making with its low-power processors. Funny thing is AAPL already embraces these new processors in their MacBooks, achieving a shocking 12-hour battery life in the 13″ MBA. Why do they think people don’t want a souped up tablet/keyboard combo that completely replaces their laptop? MSFT’s “confused” strategy is to give customers everything they want and need in a single device, while AAPL thinks people want to own and use two separate devices. How can they possibly think that when they lead the revolution that put a phone, camera, mp3 player, GPS, and web browser in a single device? The future will continue consolidation and AAPL’s two-pronged strategy will be as obsolete as point-and-shoot cameras and hand-held GPS units. AAPL also made a big deal about “turning the industry on its ear” by giving away software for free. Never mind that Google’s been doing it for years and the Surface RT already includes Office, but now that AAPL is doing it, it is revolutionary. Earlier this year Cook claimed AAPL is a software company. I’m not sure how a software company makes money when they give away their main product for free. Google is an advertising company that gives software away for free so they can sell more ads. By giving away its software for free, AAPL is making a strong case that it is a hardware company and they give away the software in order to sell hardware. What little software AAPL previously sold, they are now giving away for free, so I don’t buy the “we’re a software company” line. And as far as software goes, I downloaded Mavericks and they need to give it away for free because it is such a minor upgrade I have yet to notice a difference. They added iBooks and re-skinned the calendar. Wow, color me impressed. Oh wait, how could I forget, they added iMaps, meaning I need to hide this half-baked app on my computer just like I did on my iPhone. Stocks ramped up following an employment report that missed expectations. This pushes us to fresh all-time highs as we continue the nearly year-long rally off the post-election lows. This move clearly broke the summer’s 1500-1600 trading range and is in the middle of its next directional move. The market is well above previous highs and anyone holding a diversified portfolio is sitting on profits. This rebound rewarded everyone who held recent weakness, making them even less likely to sell the next dip. Fewer sellers equals tight supply, allowing us to continue rallying on modest demand. 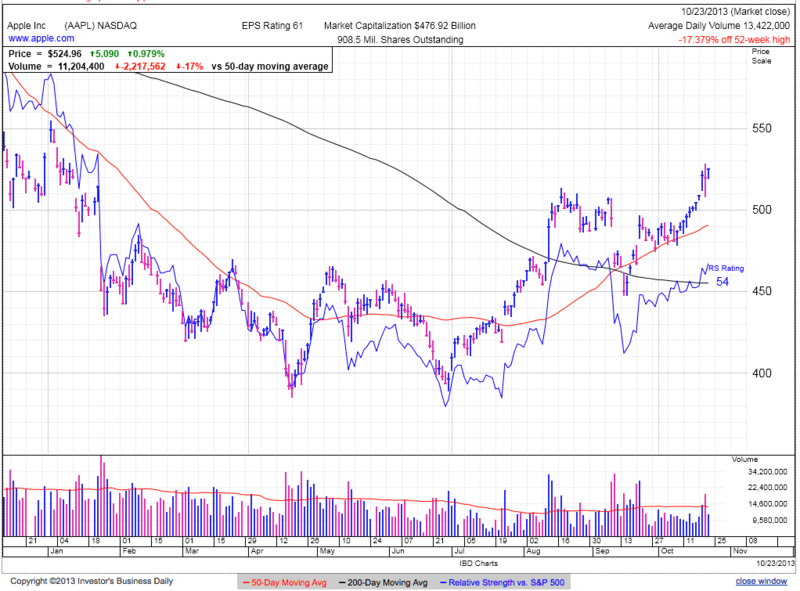 Low-volume strength has been the theme of the year and it will likely continue into year-end. This run-up is pressuring anyone still sitting on the sidelines. Those that sold recent weakness are looking for ways to get back in and this surge leaves them stuck between a rock and a hard place. Do they chase new highs, or wait for a pullback? So far anyone waiting for a pullback keeps falling further and further behind. They can only wait so long before they are forced to buy this strength and the pressure to chase will keep a bid under the market as the desperate buy every dip. The market is up 20% for the year and most money managers are well short of their benchmarks. This is the easiest buy-and-hold market no-one trusts. Even bulls are suspicious of this strength and wondering if they should lock-in profits. This doubt is the fuel that keeps propelling us higher. This morning’s price-action indicates many traders still believe bad is good as they bought the weaker than expected employment. The theory goes that prices rally on excess liquidity from QE and a struggling economy makes it more likely the Fed will keep printing money. At least that is how the financial press is justifying today’s strength, but the truth is bears are running out of reasons to hate this market and their buying keeps pushing us higher. The theme of 2013 has been a relentless rally that humbled anyone questioning its strength. While this market will end like everyone before it, it will go further and longer than anyone thought possible. Expect participants to transition from fear to greed as owners stop selling weakness and buy every dip. While markets top on complacency and greed, they rally as these feelings take over and we only top once everyone gives up fighting the strength. So far we are early in this transition and more upside remains. The adjacent survey shows that while bullish sentiment increased from the low 20s a couple of months back, more traders are neutral on this market and we are still a long way from irrational exuberance. The Fed and our politicians kicked their respective cans down the road and we are still awaiting the ultimate day of reckoning. While the market is coming to terms with fiscal and monetary austerity, the uncertainty surround these events still pose risks. But since these two topics have been so widely dissected and traders largely formed an opinion, they are less likely to trigger new waves buying and selling. The bigger worry is an unexpected headline that no one is talking about and not priced in. Markets only move when people change their minds and without a doubt there is something lurking out there what will cause traders to lower their expectations. We don’t know what it is or when it will happen. All we can do is wait and react before everyone else. The last few weeks saw monster gains and we should be looking for places to take profits, not initiate new positions. The cautious can sell into this strength and the optimistic can move up their trailing stops. Given today’s strength, we could put tight stops under 1740 or 1730. Those that want to give the market a little more room can use 1710. Either way, don’t let recent profits evaporate. Shocking reversal on NFLX as Reed Hastings sabotages the stock one more time by insinuating the stock is getting ahead of itself. The stock opened $35 higher and is now down more than $20. A reversal this dramatic is unlikely to be a one day event. High flying stocks are almost entirely sentiment driven and this reversal will likely rattle the confidence of holders and prospective buyers. Expect demand to dry up over coming days as potential buyers wait to see if weakness persists and in a self-fulfilling prophecy, this lack of demand will pressure prices further. If anyone wanted to short this stock, here is your invitation. I would use yesterday’s close as a tight stop, or better yet use an option strategy to control your risk. AAPL is in the process of releasing its new iPads. Most of the news likely leaked out ahead of time and is already priced in. Like the iPhone refresh earlier in the summer, we could see a buy the rumor, sell the news if AAPL doesn’t produce anything exciting and unexpected. Jobs always killed it with his “one more thing”, but it’s been years since AAPL surprised us with anything unexpected. TSLA is another momentum stock struggling in recent days. 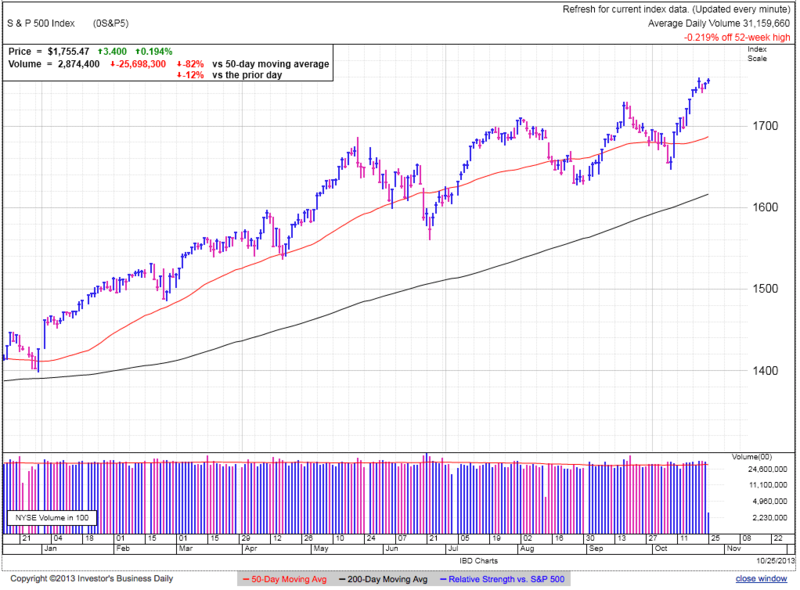 It tested and slipped under the 50dma for the only the second time since this monster run began back in April. Bulls are waiting for the dip buyers to jump in like they have every other time, but eventually there comes a point where everyone who wants some already has some. 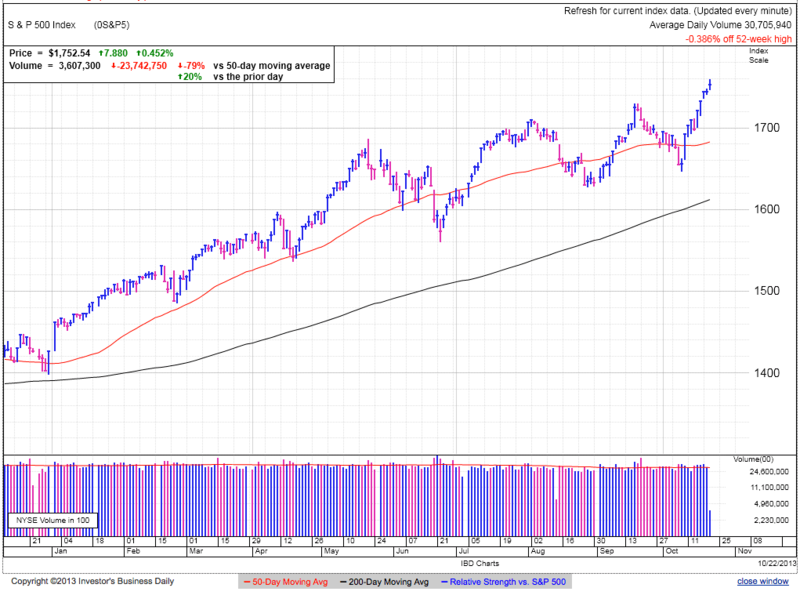 Keep an eye on the 50dma and if we fail to hold this widely followed moving average, selling will likely continue. 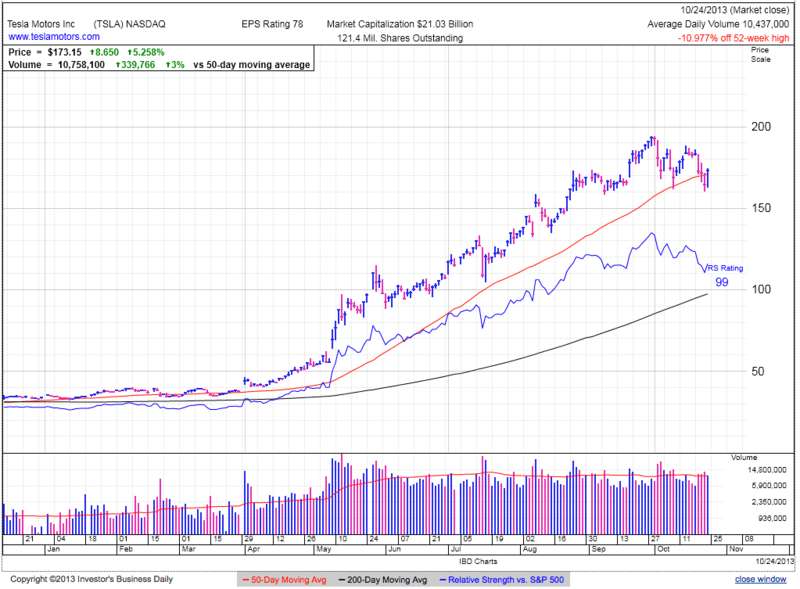 Most recognize this is a momentum stock and its bubble will pop eventually. There is nothing wrong with riding it up, but don’t take the round trip. Stocks dipped modestly by midday, yet continue hanging on to 1740 following the Debt Ceiling bounce. Earlier in the day we set another all-time high as the market continues moving beyond earlier fears of Taper, Syria, Shutdown, and Default. 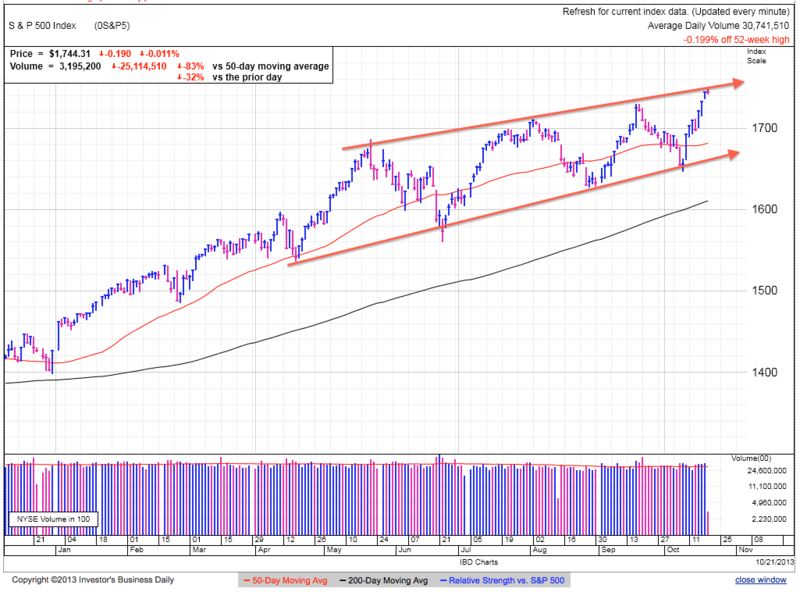 The rate of gains has slowed in the second half of the year and we are currently at the upper end of this channel. Markets typically decline swiftly and grind higher, but the last six-months flipped this conventional wisdom on its head as we grind lower and explode higher. The market is up nearly 100-points in less than two-weeks and this surge follows similarly powerful rebounds in April, June, and August. While most bears claim this market is complacent and overbought, the evidence points to the contrary. These explosive moves are a direct result of unsustainably negative sentiment. The crowd pushes the market lower in anticipation of the next correction, yet the spring explodes higher in their face each time. Too often people mistake trend for sentiment and that is exactly what bears have done. Just because we are at all-time highs doesn’t mean we are complacent. Traders are notoriously afraid of heights and few are embracing this strong market. Instead they are predicting a correction following every bump in the road. But these constant predictions of a correction keep the rally from overheating and topping. As long as the crowd remains suspicious, the uptrend will persist and every dip is buyable. While the recent rebound provided an excellent profit opportunity for those willing to bet against the herd, that spring is now sprung. Clearly we cannot continue the current rate of gains and the market needs to consolidate or at the very least slow down. Recent gains leave us with an excellent profit-taking opportunity and is the right trade for many. As gains slow, there is less reason to hold risk for modest upside. Looking ahead, most of the big fears have been mitigated and the risk of a dramatic move lower on existing concerns is unlikely. Many that sold defensively in recent months need to get back in, leading to year-end rally and that constant bid under the market will grind higher over the final two months. It is up to the individual investor to decide if grinding profits are worth the risk of the unexpected. While we largely put to bed the worst fears over Taper, Syria, Shutdown, and Default, we never really had to fear them because everyone was already talking about them and thus already priced in. We rallied as the outcome was better than the worst case and all is right with the world again…….at least until the next crisis. Currently there is not a lot of fear priced into the market and we will rally in this calm, but that is what leaves us vulnerable to the next unseen risk. The problem with trading the unknown is there is no way to know when it is coming and how big it will be. All we can do is wait and respond to the next crisis before the rest of the market fully appreciates the new risk. For the time being bears need to be patient. Don’t sell because we are too high, sell when the market is caught off guard. Recent gains over such a short period make a nice place for proactive traders to lock-in profits and wait for the next trade. Others can wait for more upside, but move up your stops to protect recent gains. If the market grinds higher into the end of the year, we should hold above 1710. If we fall under this level, we need to reevaluate our end of year outlook. AAPL is surging higher ahead of the iPad refresh and tight supply for the iPhone5s, putting us at levels not seen since January. It will be interesting to see if the excitement is warranted since the iPad upgrades are expected to be as evolutionary as the iPhone5s. The market largely expects a Retina display on the mini and a new form factor for the 10″ model. While these will help AAPL stay competitive with other tablets, it will not lead to a large wave of upgrades since these devices lack heavy subsidies. Last year AAPL ran up to $700 on its reputation as an innovator and market leader, but even with recent upgrades to the iPhone and iPad lineups, we still haven’t seen anything truly innovative and disruptive out of AAPL in years. TSLA is down 6% as it retests the 50dma. If the stock finds support and bounces off this moving average, it is buyable, but if it fails to hold, expect a wave of selling to hit the stock as it crashes through large swaths of stop-losses. If that happens, don’t buy the weakness and wait for it to find a bottom first. With high-fliers, it is better to be a little late than a lot early. Stocks surged at the open on hopes of a resolution to the looming Debt Ceiling. The market is less than 1% from all-time highs as it largely priced in a deal. We popped following the collapse of the House GOP’s alternative to the budget/debt crisis, meaning there are not competing solutions to be fought over. Ideally the House will vote on the Senate compromise and find enough moderates from both sides to pass the bill without support of extremists on either side. Markets are forward-looking and anyone waiting to buy the compromise is already too late. Safety and profits are rarely mentioned in the same sentence on Wall Street and to make money we need to buy risk when the odds are in our favor. Over the last couple months, nervous traders sold at steep discounts, creating profit opportunities for more confident investors. To be successful at this game, we need to recognize when selling is slowing down and creating entry points for opportunistic traders. There is no such thing as a risk-free trade, but paradoxically the more nervous we are, the safer the trade, and the safer we feel, the riskier the trade. The rebound continues in spite of the political bickering. I expected a little more volatility due to the stream of headlines leaking out of negotiations, but the market is holding up better than expected because most of the nervous are already out of the market, leaving few to sell each bump in the road. Without a nervous dip ahead of the compromise, we will likely see a pullback following the surge/short-squeeze on a deal. Buy-the-rumor, sell-the-news is a frequent occurrence when prices rally strongly into an expected event and there are few left to buy the news. With only hours before the much hyped Oct 17th deadline, we could see weakness Friday morning if we don’t have a signed deal. Passing this deadline is mostly psychological in nature because the US Govt won’t start missing payments for a couple more weeks. While we don’t want to get in the way of a declining market, most likely any weakness ahead of the deal is a buying opportunity since traders will quickly look past this episode before the ink is even dry. 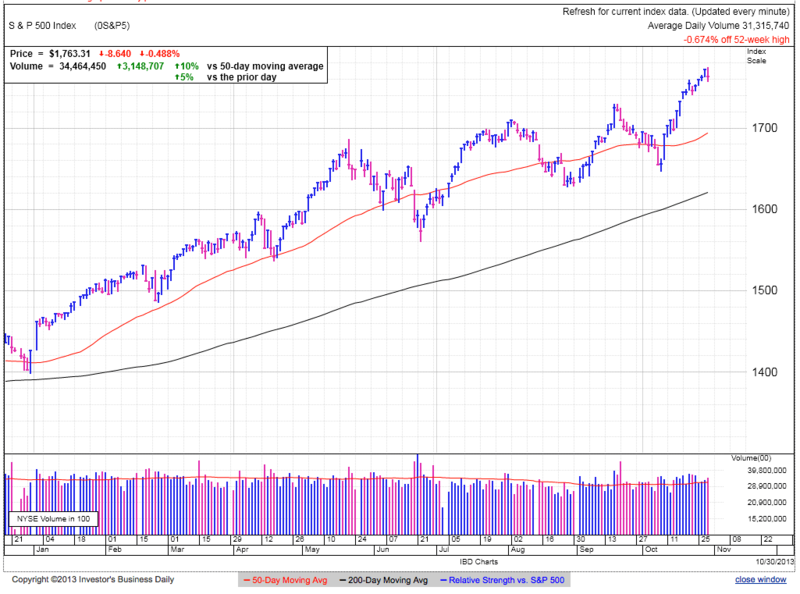 The market wants to keep heading higher, but buying a deal here is late in the game and will likely pullback either before or after a compromise is reached. The right time to buy the dip is when everyone is scared, not when most assume a compromise is imminent and a post-deal surge is widely expected. More cautious traders that bought the dip can move up their trailing stop or sell into recent strength. While there is likely more upside, we are in this to make money and we can only do that by selling our winners. Always have a plan to take profits.